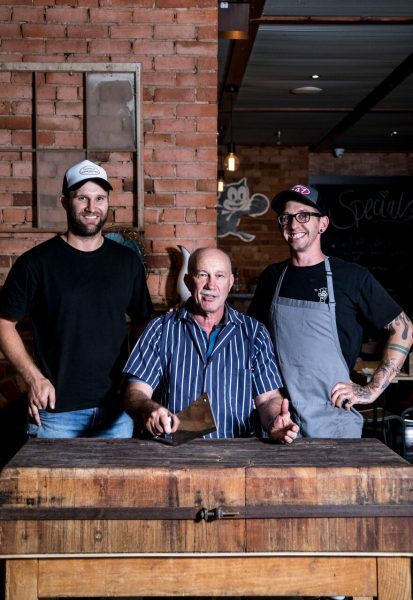 At Gamze Smokehouse, we are a family owned and operated business in North East Victoria that has a passion for good quality and locally made food. We make premium smallgoods from unique recipes with love and many years of experience. Felix Gamze migrated to Australia at an early age from his birth place in Slovenia, coming from very traditional roots with a strong importance placed on good and wholesome food. It ran in the family, with his uncle was also a butcher in their home town of Spicnik in Slovenia. The family settled in Wangaratta, where Felix went to school before starting his butchering apprenticeship in 1971. During his time learning the trade, he became very passionate about smallgoods making – how could he not, with his Eastern European heritage and being surrounded by the magnificent food bowl that is North East Victoria? Going into business for himself in 1986, Felix was able to further develop and refine his unique recipes of quality smallgoods. Graduating from a retail butcher shop to a state of the art smallgoods facility at the end of 2014. In recent times, Gamze Smokehouse products have become available in over 180 retail outlets and cafes across Melbourne, regional Victoria and Sydney allowing us to share our amazing products with a greater population. Now the taste and tradition of Gamze Smokehouse is closer to you than ever. So whether you’re hosting an elegant holiday dinner, cooking for a casual family picnic, or just shopping for the perfect gift – be sure to make Gamze Smokehouse a tradition around your family’s table.